Atlanta ornamental tree and shrub care brings unique challenges. Many insects survive our mild winters and require special applications. Our mild winters are great for humans, but they provide special challenges to Atlanta tree and shrub care. In fact, destructive insects survive the winter by sheltering in trees and shrubs. 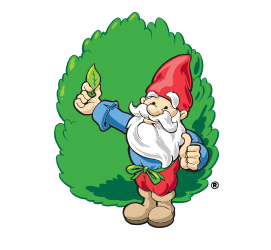 Here’s how our gnome-approved tree and shrub care protects them. Dormant oil to encapsulate leaves and stems and smother invading insects to make your trees and shrubs more resistant to disease and drought in the future. Gold, Gold Plus and Platinum customers: A fungicide to control diseases like powdery mildew and leaf spot; an insecticide to control aphids, lace bugs and leaf hoppers; and a foliar fertilizer for spring color. Gold, Gold Plus and Platinum customers: A fungicide to control diseases like powdery mildew and leaf spot. An insecticide to help control aphids, lace bugs and leaf hoppers. A foliar fertilizer applied for spring color. An insecticide to control lace bugs, aphids, caterpillars and Japanese beetles, a miticide to battle spider mites. A fungicide to control diseases like powdery mildew and leaf spot. Gold, Gold Plus and Platinum customers: An insecticide to help prevent lace bugs, aphids and caterpillars and a miticide to battle spider mites. Gold, Gold Plus and Platinum customers: A fertilizer to promote root growth to help trees and shrubs last through the winter and thrive in the spring. Gold, Gold Plus and Platinum customers: Dormant oil to protect against certain insects as in application #1. Want to keep your ornamental trees and shrubs healthy and free from disease and unwanted insects? Call Arbor-Nomics today at 770-447-6037 to see which program is right for you.